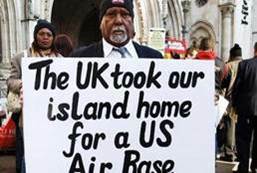 On February 25th the International Court of Justice in The Hague has issued an unprecedented legal ruling and (non-binding) judgement saying that Britain's colonial authority over the Chagos Islands is no longer legal. This brings new hope to exiled islanders. Between the 1960s and 1970s, the British Government expelled the entire population of the coral archipelago, a British crown colony in the Indian Ocean, to make way for a US American military base. The largest island, Diego Garcia (rented to this day by the UK to US military authorities) thereby became the United States' biggest base outside US territory, with more than 2,000 troops, two bomber runways, 30 warships, facilities for nuclear-armed submarines and a satellite spy station. Iraq and Afghanistan to an extent were bombed from this base. In light of these recent developments in The Hague, possibly of tremendous geopolitical impact, ISA’s regional group “Southeast Asia and Islands in the Indian Ocean” (SEAINDO) cordially invites you to watch and discuss John Pilger’s documentary “Stealing a Nation” (2004, 56 Min). The movie reports on the plight of the about 2000 Chagossians, the political conspiracy of their brutal removal from the islands and on their continuing fight for the right to return. Panel: Dynamics of Differentiation: Is the refugee/migrant distinction negotiable? Free admission. For logistical purposes, please register. AM PULS NR. 56: FLUCHT, MIGRATION & INTEGRATION – WOHIN STEUERT EUROPA? Gemeinsam mit dem Publikum diskutieren in dem beliebten Wissenschaftsformat anerkannte Forscherinnen und Forscher sowie Expertinnen und Experten aus der Praxis relevante gesellschaftliche Fragestellungen. Vortragende sind Prof. Dr. Heinz Faßmann (Universität Wien) - Thema seines Vortrages ist die Migration und involvierte Bereiche, die für die Bevölkerung zu den wichtigsten Zukunftsthemen zählen - und Dr. Steffen Angenendt (Stiftung Wissenschaft und Politik), der darüber sprechen wird, dass gemischte Zuwanderung von Flüchtlingen sowie Migrantinnen und Migranten das „neue Normal“ in Europa ist. Die DLE Studienservice und Lehrwesen möchte Sie herzlich zu einer Informationsveranstaltung für MitarbeiterInnen der Universität Wien und Hilfsorganisationen zum Thema „Studienmöglichkeiten für Menschen mit Fluchthintergrund" einladen. In der Veranstaltung sollen die Studienmöglichkeiten und Zulassungsmodalitäten für Menschen mit Fluchthintergrund und das Projekt OLIve an der Universität Wien vorgestellt werden. Aus organisatorischen Gründen wird um Anmeldung unter:refugees.studentpoint@univie.ac.at gebeten. This conference is held in the memory of Sinjar Massacre. In August 2014, the Islamic State staged a brutal attack killing scores of Yazidi men and kidnapping and enslaving a large number of Yazidi women and girls. A general understanding of the nature of attacks on women and girls who face enslavement, trafficking and sexual abuse is necessary. However, we should strive to go beyond generalization and statistics and shed better lights on the events that occurred. This conference aims to expand on the general narratives and explores various aspects of the conflict in relation to women’s role and status, with a number of experts reflecting on the topics from various disciplines and key areas. Spätestens seit den großen Schiffsunglücken im April 2015 mit mehr als 900 Ertrunkenen, ist die Bekämpfung der „Fluchthilfe-Schlepperei“ zu einem zentralen Thema der EU-Migrationspolitik geworden. Neben der militärischen Bekämpfung durch die Operation EUNAVFOR Med (später Sophia genannt) findet aber schon seit langem eine Verfolgung und Kriminalisierung von Menschen auf der Flucht und denen, die ihnen die Überwindung der Grenzen ermöglichen, statt. Letztere werden äußerst vereinfacht und pauschal als skrupellos und ausschließlich profitorientiert, denen Menschenrechte nichts gelten, an den medialen Pranger gestellt. Seit einigen Monaten unterstellen Frontex und italienische Staatsanwaltschaften sogar den privaten Seenotrettungsorganisationen Kontakte mit libyschen „Schleppern“. Sie diskreditieren und kriminalisieren diese NGO´s in der Öffentlichkeit, um sich der lästigen Augenzeugen auf See zu entledigen und den Ankünften Einhalt zu gebieten. Um dem Wahrheitsgehalt und der Realität des sehr breiten Spektrums von Fluchthilfe bis Schlepperei auf den Grund zu gehen, haben Organisationen aus Deutschland (borderline-europe), Griechenland (Diktio), Italien (Borderline Sicilia) und Österreich (Asyl in Not) in den vergangenen anderthalb Jahren gemeinsam diesen Ausschnitt der EU-Migrationspolitik untersucht: Angefangen von den zugrunde liegenden internationalen Vereinbarungen, deren bedingte Übernahme in EU-Richtlinien wie das Facilitators Package, und letztendlich in die jeweilige nationale Gesetzgebung. Parallel dazu sind in den vier Ländern Gerichtsverfahren beobachtet und begleitet worden, sowie zivilgesellschaftliche Aktivitäten, die sich gegen die Stigmatisierung von „Fluchthelfern“ richten, zusammen¬getragen worden. Die in der vorliegenden Dokumentation zusammengefassten Erkenntnisse und Bewertungen werden am 18. Mai 2017 in Berlin, Palermo und Wien parallel vorgestellt. Ermöglicht wurde dieses transnationale Recherche- und Veranstaltungsprojekt durch die Unterstützung aus dem EU-Programm „Europa für Bürgerinnen und Bürger“. Aarhus, Amsterdam, Berlin, Bologna, Budapest, Cambridge, Delmenhorst, Edinburgh, Freiburg, Helsinki, Jerusalem, Lyon, Madrid, Marseille, Paris, Uppsala, Vienna, Warsaw, Zürich. The Programme welcomes applications worldwide from promising young scholars as well as from leading senior researchers. Please note: Applications from scholars at risk are particularly welcome. Uppsala University invites paper proposals for a U4 Cluster Conference Social Sciences, Economics and Law (SSEL), hosted by Uppsala University, 29-30 May 2017. ​U4 is a strategic partnership between Ghent University (BE), University of Göttingen (DE), University of Groningen (NL), and Uppsala University (SE). It is based on well-established, existing, bilateral agreements between the partner universities. The U4 cooperation is especially intended to take stock of academic research activities within the participating universities. The aim is to disseminate research, stimulate research cooperation, and provide a venue for innovative and multi-disciplinary research approaches and critical reflection. The SSEL Conference 2017 aims to bring together researchers and PhD students from the participating universities on topics specifically addressing today’s global challen ges for societies. The conference theme of the contemporary dynamics of migration operates at many levels in society. It involves challenges emanating from different kinds of population movements, influencing issues of borders, governance, legislation, labour, health and mediation of refugeedom among others. Harokopio University Athens, Greece, from 23 to 26 August 2017. For the fifth year the Department of Social Anthropology and History of the University of the Aegean and the Institute of Migration and Ethnic Studies of the University of Amsterdam welcome applications for the Postgraduate International Summer School ‘CULTURES, MIGRATIONS, BORDERS’ that will take place on the border island of LESVOS, GREECE, from4 to 15 JULY 2016.
ausgerichtet sind. Außerdem will die Tagung neben der Präsentation empirischer Forschungsergebnisse auch die theoretische bzw. konzeptuelle und methodische Reflexion fördern und nicht zuletzt auch den Bezug zur Praxis herstellen. Ausgewählte Beiträge werden in einem Jahrbuch veröffentlicht. Damit sollen die Leistungen und Forschungsfragen der österreichischen Migrations- und Integrationsforschung regelmäßig dokumentiert werden. Die VeranstalterInnen laden hiermit alle Interessierten ein, Vorschläge für Panels und Vorträge für diese Tagung einzureichen. The sixth Istanbul Human Security Conference will be taking place on 20-21 October 2016. As a close collaboration between the Centre for Trust, Peace and Social Relations (CTPSR) at Coventry University, the United Nations Human Security Unit and Kadir Has University in Istanbul, the conference will be hosted by Kadir Has University in Istanbul. This year, we are focusing on displacement and human security due to the importance and urgency of this topic. Currently, there are around 60 million displaced people around the world. Although displacement is not a new phenomenon, it can be said that this is a highly important issue considering the fact that this is the highest number noted since the World War II. Among many conflicts in the world, the war in Syria and its spill-over to the Middle East should be mentioned as they created more than 10 million internally displaced people and refugees which affected not just the neighbouring regions but other continents including Europe. The exponential influx of refugees has led to humanitarian crises which the international community had to face. This situation surely brings human security implications that both individual governments and international organizations have to address immediately. European governments and other international organizations are constantly trying to find a common response to the current developments, however there is still much to be done in terms of accomodating refugees, sustaining national and human security in order to properly care for the displaced and reassure the host populations. This year, we are accepting presentations from authors who will focus on displacement and human security related issues. Our aim is to bring about a fresh approach to the turmoil that is engendered by the so-called refugee crisis and provide suggestions and solutions to move forward. We are open to presentations that focus on the implications of Syrian War on displacement but we also welcome others that focus on any other case study that has to do with displacement and human security. ​Deadline für Abstracts: 17. Juli 2016Jahrestagung der Sektion Feministische Theorie und Geschlechterforschung der Österreichischen Gesellschaft für Soziologie in Kooperation mit der Sektion Kritische Migrations- und Rassismusforschung. Tagungsort: Die Veranstaltung findet im C3 Centrum für Internationale Entwicklung, Alois Wagner Saal, Sensengasse 3, 1090 Wien statt. Zur Tagung: Feministische und intersektionelle Forschungen haben die vielfältigen Zusammenhänge von Migration und Geschlecht empirisch erforscht und theoretisch reflektiert. Während dabei zumeist Lebenssituationen von Migrantinnen sowie Prozesse der Feminisierung der Migration im Vordergrund standen, steht die Forschung zu Migration und Männlichkeit noch in ihren Anfängen. Die Tagung möchte aktuelle empirische und theoretische Arbeiten zur Konstruktion von Männlichkeit, Migration und Differenz zusammenbringen und Raum für wissenschaftlichen Austausch bieten. ​The Moise A. Khayrallah Center for Lebanese Diaspora Studies will host an international conference—titledThe Stakes of Middle East and North Africa Migration Studies—at North Carolina State University (Raleigh, North Carolina, USA) on April 21 & 22, 2017. Vienna - June 29, 2016. Das Kuratorium für Journalistenausbildung (KFJ) organisiert in Kooperation mit dem Österreichischen Integrationsfonds (ÖIF) einen Workshop für Journalisten, die mit dem Thema Integration, Migration und Flucht befasst sind. Vier Referent/innen werden die Arbeit an einer gelungenen und verantwortungsbewussten Berichterstattung zu Flucht, Migration und Integration unterstützen. 02. Juni 2016, 15 s.t. Worldwide more than 42 million people are fleeing war and persecution. According to UNHCR “Women and girls comprise about half of any refugee, internally displaced or stateless population”. According to UNHCR data, women account for approximately 50.3% of Syrian refugees today. Among the refugees, arriving to Europe recently, especially through the Balkan route, the number of women on among refugees is increasing. According to the UNESCO the figures from Macedonia reflect this development; the percentage of women and children among the refugees passing through Macedonia during September 2015 was 36%, and increased in October to reach 44%. Hence, the reasons for flight of women are diverse. Patriarchal structures on various levels have immediate consequences on both reasons and experiences of flight of women. Often, women are also faced with an additional gender-based violence both in the context of political upheaval, on the road as well as often also in the shelters. Contributors will be Yanis Varoufakis, Saskia Sassen, Srećko Horvat, Fanny Müller-Uri, Erich Fenninger, Teresa Forcades, Sandro Mezzadra, Walter Baier and Katja Kipping, among others. Warum wir gehen. Wohin wir wollen. Migrationsursachen in Afrika. wiehelfen? "Flucht, Asyl und freiwilliges Engagement"
Inhalte und Zielgruppen: Die Podiumsdiskussion soll als Auftaktveranstaltung Vertreter_innen aus Forschung und Praxis zusammenbringen, um sowohl die Vielschichtigkeit des Themas hervorzuarbeiten, als auch den Zuhörer_innen verschiedene Perspektiven und Meinungen anzubieten. Die Diskussion richtet sich an interessierte Studierende, Lehrende und Helfende. Diskutiert werden sollen aktuelle und zukünftige Probleme Österreichs im Umgang mit geflohenen Menschen aus der Perspektive der Diskutierenden, sowie Prognosen und Hoffnungen der Beteiligten und die Rolle der Wissenschaft.